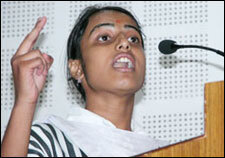 The Young Orators' Club is an event that took place on 10-Jun-2006 in Hyderabad. A slippery tongue can be a precariously devious device. And that's what we love about it. The Young Orators' Club (YMCA) hones in on young yakkety-yak talent. But if you expect empty bombast, you better go some place else. The Club, established in 1969, is a pro at its job. Everything from weighty political matters and ideological debates to book reviews and art appraisal finds space under this umbrella. Young minds exchange fresh perspectives and inventive ideas. Club members meet up every saturday at YMCA. Guests are always welcome, to lend their ears, and even better, their thoughts. Please contact Gnan at 98852-59348 for further details. Be the first to comment on The Young Orators' Club! Just use the simple form below. fullhyd.com has 700,000+ monthly visits. Tell Hyderabad what you feel about The Young Orators' Club!